​. At early R3M we have two screws on the trigger. Like on that picture. As you can see there are two screws there. They worked as follows — when you push the trigger the screw # 1 start to push the plate of the balance-beam. In the beginning of the movement of the trigger the screw # 2 is not touching the beam, but before the sear ready to release the hammer the screw # 2 touch the beam and the shooter feels it as "step", indicating that now there will be shot if he pushes a little more. 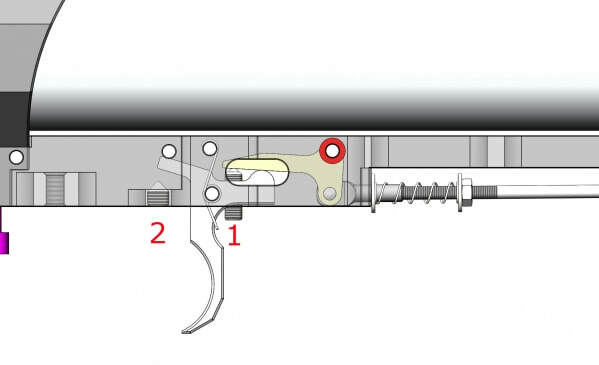 So, by adjusting by those two screws it was possible to set the moment when the screw # 2 touch the beam, thus making the trigger harder or softer, adjusting the step, making it from hard to no step. Then I decided that we don't need the screw # 2, as it just makes the adjustment too complicated for those who doesn't understand the logic of the work and I removed it and made the pad on the trigger, instead of it. Look at the next picture. So, the logic of the work is the same — by adjusting the screw # 1 the shooter can adjust the moment when the pad touching the surface of the balance-beam. So the adjustment at R3M remaind the same as it was before, but easier. As you can see we have two screws again But they are not as it was before. 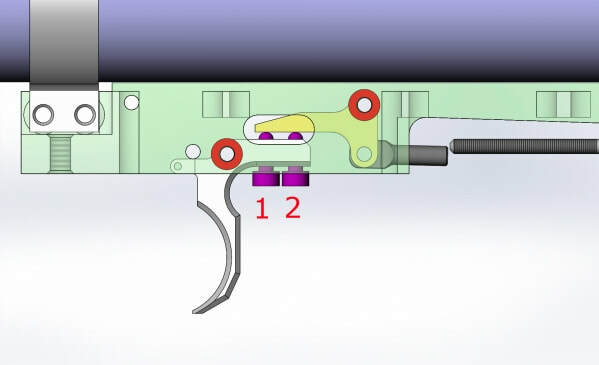 The adjustment of the trigger is the same as it was at late R3M, the shooter should use the scew # 1 to adjust the "step" making it harder or softer or remove it completely. But the screw # 2 has nothin with the trigger. That is the stopper. You know when you shoot and the trigger keeps moving the accuracy is work in comparison with the case when the trigger stopped right after the hammer released off the sear. So the screw # 2 is to be set to stop the tirgger. 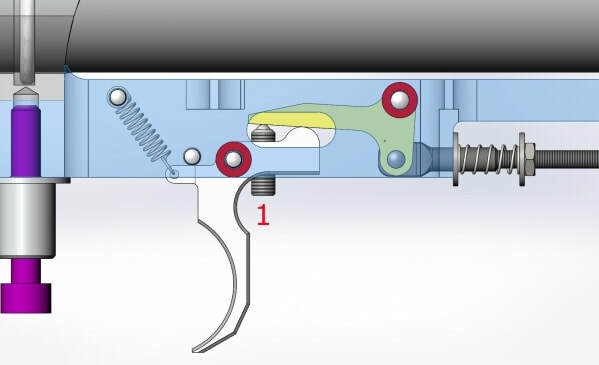 It is very easy to do — ajust the trigger to your comfort way, then screw up the # 2 and check out if the hammer still is able to be realeased of the sear when you push the trigger, When you get the position when the hammer is still hold by the sear though you pushed the trigger up to the end — unscrew it a little bit back. So, when you adjust it this way you will have the trigger you want and it will stop immidiately the hammer is rellease, that will help you with the accuracy. Hope it was helpfull for you.